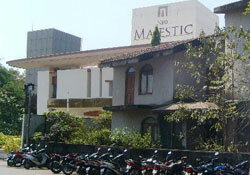 The Majestic Goa is the finest luxury business hotel in Goa. The Majestic Goa stands for the convergence of time-honored Indian hospitality and international modernism. The Majestic presents a business guest or a holiday guest a choice of world-class leisure and business facilities, exquisite cuisine and the inimitable comforts of a home. Goa a great rendezvous for beach revelers finds the right unwinds of the pool, the gym, the barbeque and the wining and dining. Experience the new age of Indian hospitality. Goa welcomes a cosmopolitan, corporeal culture to its enticing realm, as a rush of blue waters wets the silver sands and the sky mirrors the sea below, The land of perpetual gaiety and happy abundance beckons you to ‘5 star’ facilities and comforts with the most amicable means. Whether on business or a holiday stay the royal way at - 'The Majestic'! Oriental, Continental and authentic Indian delicacies prepared by master chefs do wonders to your taste buds. Quietly elegant ambience with tasteful décor is elating to the spirit. We have chic restaurants, the multi-cuisine Zayka, pool- side bar-be-que Angethi, Mandovi and Gagar Bar serving Indian and imported liquor and cocktails as the winsome spots in The Majestic. There is also a 24 hr. Coffee Shop to drop in for a quick sip, anytime! There is a Club-House for relaxed parleys. You can spend good time in the Shopping Arcade and have a vitalized day after a workout at the Health Club, which specialises in the famed Kerala massage. Look great with a quick hairdo, or pamper yourself at the Beauty Parlour. A Sauna & Steam bath for refreshing your mind and body and a Jacuzzi where you can lay back, relax and rejuvenate yourself. The Swimming Pool also helps enliven your spirits after a sprightly dive. There is always a Doctor available in emergency, so needn’t worry! The Majestic offers three types of bedrooms for a quiet repose. They are elegantly designed and maintained with central air-conditioning and all modern amenities. Suite: This section offers an elaborate set up of two rooms and a lounge for your comforts. It is centrally air-conditioned with running hot and cold water available 24 hours, and a television. Deluxe: This can also accommodate two persons with all convenient facilities, television and an attached bath. Standard: This the most easily affordable of all the three. You also have beds for two with TV and facilities as in the Deluxe and Suite.